The North Carolina State University College of Veterinary Medicine is instituting the Charlotte Bacon Veterinary Education Scholarship to be awarded to a qualified veterinary student who has significant service to children in an educational or community setting. 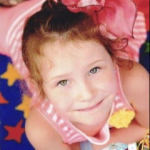 The scholarship honors six-year-old Charlotte Helen Bacon, one of the Sandy Hook Elementary School children who died on Dec. 14, 2012. According to her parents Joel and JoAnn Bacon, Charlotte never met an animal she didn’t love and wanted to be a veterinarian since age two. Parrett approached Newtown resident Aaron Carlson with the scholarship idea. Carlson, whose daughter was a close friend of Charlotte, helped initiate the Newtown Kindness organization and serves as a spokesperson for the Bacon family. The Newtown Kindness organization recently created the Charlotte Bacon Act of Kindness Award which will annually recognize children doing acts of kindness. The scholarship is available to NC State College of Veterinary Medicine students who are in their first through third year of study, who are interested in companion animal or equine medicine, and who have a track record of significant service to children in an educational or community setting. For more information concerning the Charlotte Bacon Veterinary Education Scholarship contact the North Carolina Veterinary Medical Foundation at 919.513.6660.